The American Therapeutic Recreation Association (ATRA) has several groups that members can join. People attending the ATRA 2018 annual conference had an opportunity to attend breakout sessions with several of the different ATRA group leaders on Friday, September 14, 2018. These groups have many benefits. You can connect with other recreational therapists working in the same setting. You can learn about evidenced-based practices. I work at a Psychiatric Residential Treatment Facility (PRTF) providing services for children and adolescents for 16+ years. I’m a member of the Behavioral Health Group and the Child and Adolescents group. I also volunteer for public policy in recreational therapy with an emphasis on behavioral health. The behavioral health group is often focused more towards adults with mental health needs. The child and adolescents often feels more related to physical rehab and medicine. There could be an even smaller group that consists of behavioral health for child and adolescents. I’ve attended breakout sessions in both behavioral health and child adolescents at previous annual conferences. I didn’t attend either of these sessions this year, which I regret not being able to attend them all. I attended the school section committee because I’m interested in learning more about recreational therapy in the schools. Which group would you be best suited for? Post below. 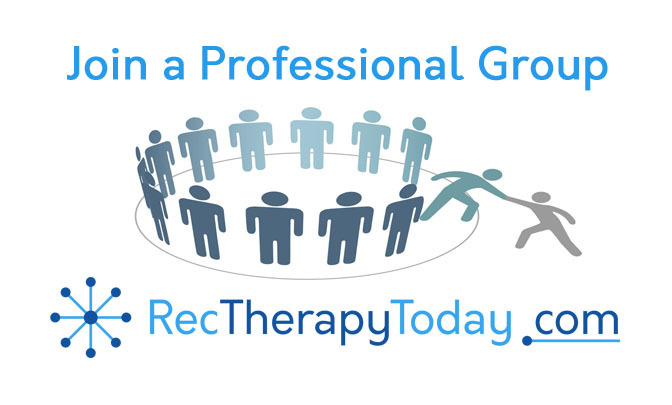 Danny Pettry (founder of RecTherapyToday) has been a good-standing member of ATRA since 1999. Pettry is not a hired spokesperson for ATRA. Pettry is not an elected ATRA Board member. Pettry is a Lifetime Member of ATRA who volunteers his time to assist with several ATRA committees. Danny Pettry provided his best efforts in preparing blog entries. It is noted that Pettry does not speak on behalf of ATRA. Danny Pettry does encourage readers like you to join ATRA.